EnergyI cover oil, gas, power, LNG markets, linking to human development. Despite the Autumn shoulder season being in full force, natural gas prices have been continuing their rise, with prompt month prices up 34 cents, or 12%, to today's close at $3.24 per MMBtu since September 19. We've blown past important technical resistance at $3.19 and $3.23. These are the highest prices since the end of January. The start of the rise up was really triggered by forecasts that showed a potential cold outbreak in the high demand regions of the East and Midwest to start this month. This hasn't exactly materialized: it's gas used for electricity that's up 17% over the past week, with Residential/Commercial demand declining. With winter just five or so weeks away, the market is realizing that we will go into winter with the lowest gas storage since 2003, perhaps just 3.25 trillion cubic feet, well below the 3.8 Tcf that we saw last year. The rise up was to be expected since such low storage numbers yet still low pricing made clear that gas has been a greatly undervalued commodity. Despite record U.S. gas production, a cold April and hot summer have not allowed gas inventories to sufficiently rebound, with a deficit of at least 14% across all regions. This is being exacerbated by high demand which could average 5-7 Bcf/d higher this winter than last, where demand in December, January, and February, averaged about 100 Bcf/d. But a strong El Nino this winter would help hold price increases in check and counterbalance the very low storage number. "El Nino brewing: Another mild winter ahead?" U.S. gas production continues to hit record highs, now at nearly 84 Bcf/d, versus 75 Bcf/d this time last year. 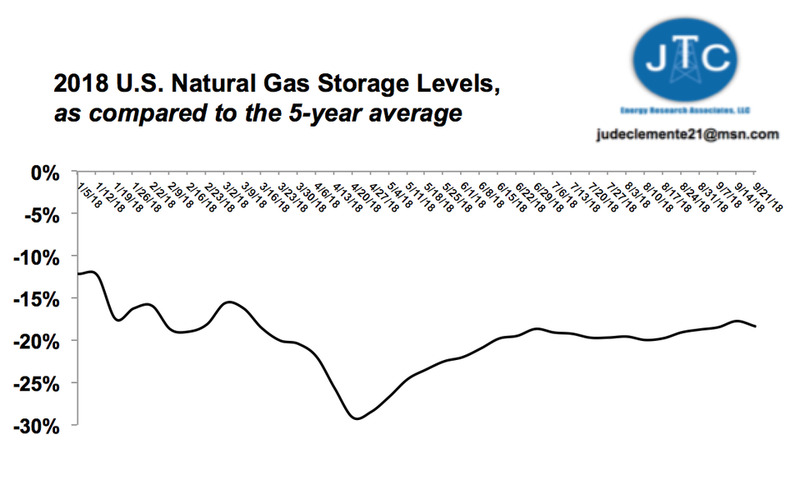 Rising production could be the additional supply needed to compensate for a lack of gas in inventories. In Appalachia, which should hit an astounding 30 Bcf/d of production next month, both the 1.7 Bcf/d Atlantic Sunrise and the 1.5 Bcf/d Nexus pipelines are awaiting final authorization from FERC for in-service requests. Atlantic Sunrise would feed Marcellus gas to markets on the Atlantic Seaboard, with some 0.55 Bcf/d having already been placed into service. The long-awaited Nexus will ship gas from Appalachia into the Midwest and Canada. Despite the pipeline constraints we've kept hearing about, Permian gas production, incentivized of course by U.S. oil prices today at $76 (or the highest they have been since November 2014), is closing in on a whopping 12 Bcf/d, per EIA estimates. Overall, U.S. shale production this month will bring about 1 Bcf/d more to make total shale output over 73 Bcf/d, as compared to September.